Minion Raya here, reaching out to let everyone know a little about Subterranean Press's limited edition of The Knight of the Seven Kingdoms collection. Bound in an oversized hard cover limited edition and lavishly illustrated by the talented Gary Gianni. so get one while you still can. 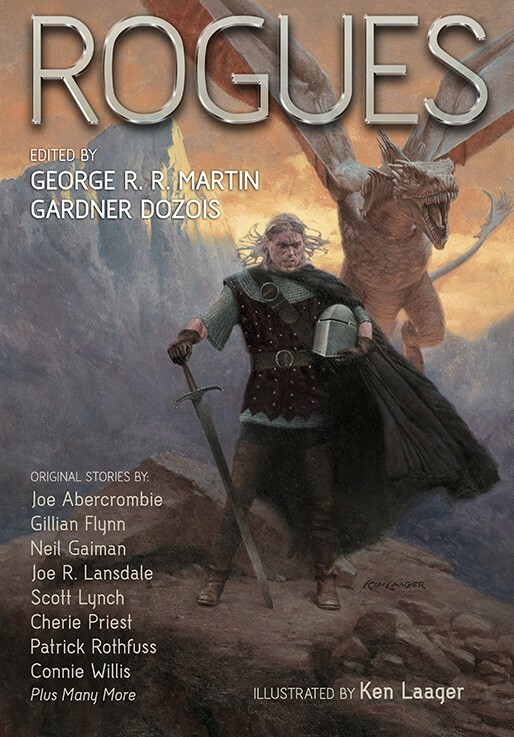 So Gardner Dozois and I put together this gargantuan crossgenre anthology called ROGUES for Bantam, featuring a great lineup of original stories about cads, swindlers, n'eer-do-wells, and scoundrels from some of our favorite writers. It was published in hardcover a few months ago, to terrific sales (debuted at #7 on the NEW YORK TIMES bestseller list) and some great reviews. Lots of people seemed to like it. One of them turned out to be Bill Schafer, of Subterranean Press. Who liked it so much he decided that SubPress would do its own edition. Look for it early next year. Or, better still, start checking the SubPress website so you can place an order as soon as it becomes available, since the SubPress editions tend to sell out… and yes, this one will be limited to 500 copies. Like all SubPress limiteds, it will be gorgeous. Slipcased, numbered or lettered, signed by Gardner and me and all of our writers, acidfree paper, beautiful design… and lavishly illustrated by Ken Laager, a very talented artist best known for his work in noir. Here's his cover, based on my own contribution to the volume, "The Rogue Prince." The Rogues are coming back. Beware. All the copies of this one have long ago been reserved… but inevitably, with these special editions, there are a few drop-outs who have “rights” to the book, by virtue of their purchase of the previous volume in the series, but fail to follow through. Which means that some number of copies will be made available to new purchasers. How many? That’s hard to say. SubPress does not keep a waiting list, no… but check the website frequently and look for an announcement… and do not hesitate when you see it. Maybe you can snag a copy. 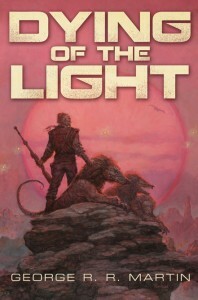 And speaking of Subterranean… they do still have copies available of a couple of my other titles, including their trade hardcover of my first novel, DYING OF THE LIGHT, with great artwork by Tom Kidd. And serious collectors might want to check out their listings for HUNTER’S RUN and STARLADY / FAST-FRIEND as well, before the remaining stocks are gone. DYING OF THE LIGHT was first published by Pocket Books back in the dawn of time (that’s 1977 to you young punks), when Jimmy Carter was in the White House, and I was a college journalism instructor with dark brown hair. I had already been writing and publishing science fiction for six years, many of the stories set against the same future history, a very loose background I later named the Thousand Worlds. Novels were long and scary, but I finally decided I was ready to tackle one in 1976. I wrote the entire thing start to finish before giving it to my agent to sell. My title was AFTER THE FESTIVAL. Pocket, after winning the auction against three other publishers, decided that wasn’t science fictional enough and made me change it. I didn’t mind… much. DYING OF THE LIGHT fit the book just as well. By any title, it was a Thousand Worlds book, probably the culmination of that phase of my career. A melancholy, romantic, elegiac sort of novel it was, but then I was a melancholy romantic myself in those days. It did pretty well. Even made the Hugo ballot that year, losing to Fred Pohl’s GATEWAY at Iguanacon II in Phoenix, 1978. The reviews were good too. But don’t take my word for it. Subterranean Press has just published a lovely new hardcover of the book, copiously illustrated by the talented Tom Kidd, signed by both of us, and limited to 500 numbered and 26 lettered copies. I hope you will enjoy your visit to my past… and the distant world of Worlorn on the edge of the galaxy, in the far distant future. 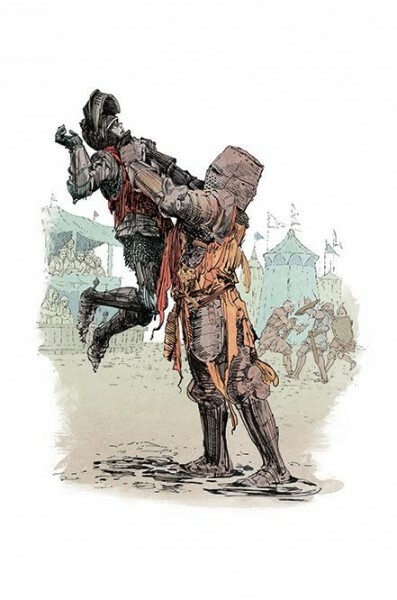 … Subterranean Press will soon be published a new signed, limited, slipcased limited edition of my first novel, DYING OF THE LIGHT, lavishly illustrated by the amazing Tom Kidd. Good luck to all, and enjoy the read. From time to time I get emails from readers wanting to know how they can purchase copies of the signed, illustrated limited editions of the Ice & Fire books published by Meisha Merlin and Subterranean. The short answer is, they can’t. Those were limited editions, they were fully subscribed, Meisha Merlin is out of business, and SubPress has no extra copies for sale. (Yes, I have a few extra copies myself, but they are not for sale). However, I’ve just happened to notice that there are presently not one but two (2!) sets of said limited up for bid on ebay. These are the numbered editions (not the rarer lettered), and both have matching numbers. The ebay item numbers are 221012911878 and 150806055324. I don’t know the sellers, and I can’t vouch for them or the condition of their books. (I will vouch for the fact that these are gorgeous books, lavishly illustrated by Jeff Jones, John Howe, Charles Vess, and Tom Canty, respectively). These ebay sales have nothing to do with me, and I cannot tell you more than I just have. If you have questions, you will need to contact the sellers. But considering how often I get asked about those books, I thought I’d mention it, if any of you are interested. Please be advised: these sets are not cheap. The books have appreciated quite a bit in value since publication. Cool things are happening at Subterranean Press. 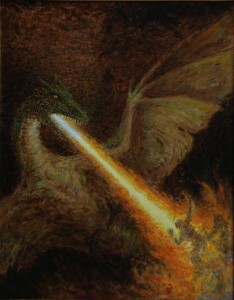 Marc Fishman has delivered all the artwork for the SubPress limited edition of A DANCE WITH DRAGONS, and the book should be at the printer soon. Alas, I believe all the copies are spoken for… but those of you who preordered have something to look forward to. 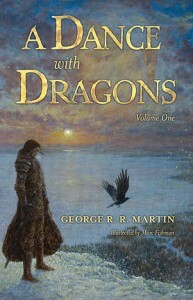 Just last week I scrawled my scrawl on the signature pages for the new SubPress two-volume slipcased limited edition of A GAME OF THRONES, below a lovely Ted Nasmith drawing. Ted has completed all his other outstanding assignments, and turned his full attention to the illustrations for GAME. I’ve been seeing sketches several times a week, and I’m jazzed. I do love illustrated books, and this one promises to be stunning. 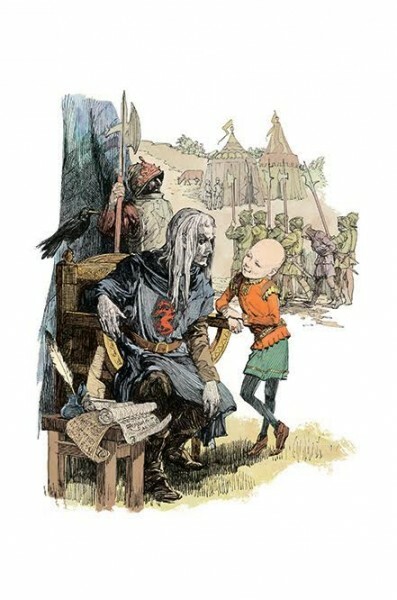 And now I am thrilled to be able to announce that Subterranean has secured the talents of RICHARD HESCOX to illustrate their signed, numbered (and lettered), deluxe, slipcased edition of A CLASH OF KINGS. Those of you who attended the worldcon in Reno will likely remember seeing some of the gorgeous work that Hescox had on display in the art show there (one canvas, the Lamia, now hangs on my wall here in Santa Fe). Others may know his work from Boskone art shows. Or perhaps you have his book, THE DECEIVING EYE: THE ART OF RICHARD HESCOX. Most of you will have seen his book covers and movie posters over the years. For those unfamiliar with his work, suffice it to say that Hescox is a veteran SF and fantasy artist and illustrator, and that I’ve loved his stuff for a long time, especially his oil paintings. We’ve already been firing emails back and forth, and Richard is as enthused as I am. 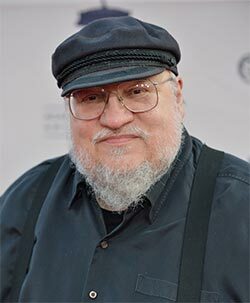 I cannot wait to see him bring my world and characters to life. As usual, the Subterranean CLASH OF KINGS will be limited to 52 lettered and 448 numbered copies, each signed by me and by the artist. Those who purchased the prior SubPress editions will have first dibs, of course, but there are always some dropouts, so it is possible that a few copies will become available to newcomers around publication date. SONGS OF THE DYING EARTH is now out of print in all editions, Subterranean Press informs me. Sorry if you missed your chance the snag a copy of this beautiful illustrated edition. You can still read the stories, though. The Harper Collins Voyager hardcover from the UK will be along in October, and can be preordered from Amazon UK. Tor’s edition will follow in about a year.